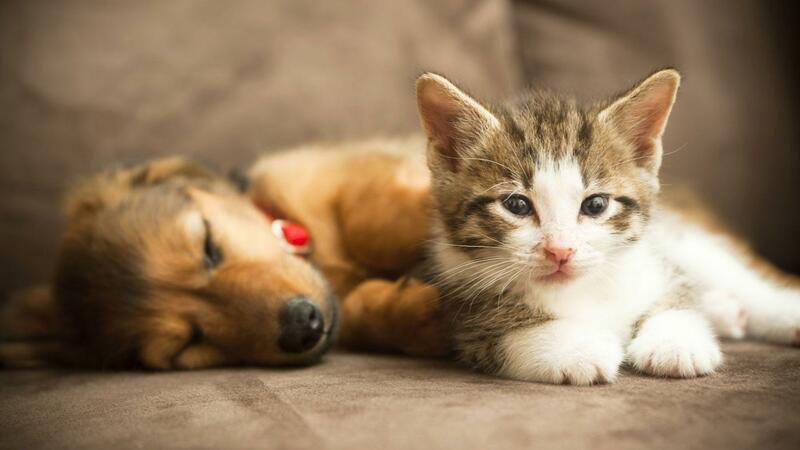 Can a Kitten and a Puppy Become Friends? Whether or not dogs and cats are capable of making 'friends' in the same way humans do may be up for debate. However, it is possible to introduce puppies and kittens in such a way as to ensure the two domesticated animals will be safe in each other's company while living in the same home. Because both species of animal tend to have natural instincts that will lead to a hostile relationship, special care usually must be taken to ensure that a dog and cat will not pose a mutual or one-sided threat while living together. This process typically involves an introductory meeting that takes each animal's innate temperament into account, allowing both pets to remain safe and comfortable during the introduction. Animal behavior experts commonly offer tips for introducing a cat and dog that will be sharing the same living space. These tips include providing room for the cat to escape and hide if it feels threatened and ensuring that the dog in question is carefully restrained, particularly if the dog is from a breed with a strong prey instinct. If the cat needs to run away, it should be able to do so, and the dog should not be allowed to follow. What Animals Can You Adopt at the Kent County Humane Society? Where Can You Adopt a Persian Cat or Kitten? What Are the Requirements for Adopting a Shihpoo Puppy? Is It Legal to Adopt Wolf Puppies? What Do Persian Cats Eat? What Kind of Pet Is a Serval? Is Pet Adoption More Humane Than Buying a Pet From a Puppy Mill? What Are Some Puppy Obedience Training Tips?